GGBP have published almost all Monica Edwards’ Romney Marsh and Punchbowl Farm titles, as well as a Companion to each series and a biography. You will find full details of these on the All Books ever Published page. Monica herself knew both locations well. She was a vicar’s daughter, who barely went to school, grew up in Rye Harbour (the fictional Westling) and worked briefly with horses before her marriage to Bill Edwards. They moved to Punchbowl Farm near Thursley in Surrey. 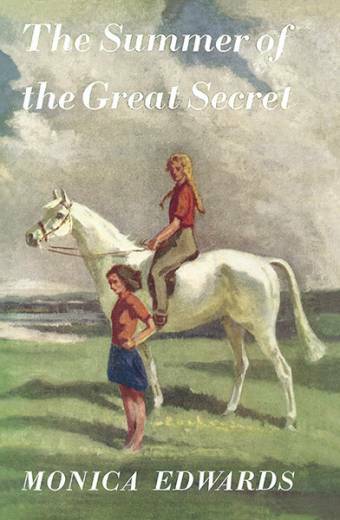 Please note that The Summer of the Great Secret will not be published until the end of May or early June 2019 but it will be very helpful if you can order it now. 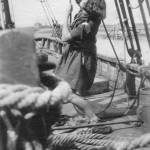 The author picture shows the young Monica pulling ropes on Crusty Crampion’s Meteor – very appropriate for SGS.